Vice President Mike Pence is dismissing the refusal of 45 states to comply with his Election Integrity Commission's request for private voter data as "fake news." But he's the one who's not telling the truth. Mike Pence lashed out in response to news reports about the refusal of states to comply fully with his so-called Election Integrity Commission's request to turn over sensitive voter registration data. On June 28, the Presidential Advisory Commission on Election Integrity issued a letter requesting that states provide publicly available voter data as permitted under their state laws. At present, 20 states have agreed to provide the publicly available information requested by the Commission and another 16 states are reviewing which information can be released under their state laws. In all, 36 states have either agreed or are considering participating with the Commission's work to ensure the integrity of the American electoral system. While there are news reports that 44 states have "refused" to provide voter information to the Commission, these reports are patently false, more "fake news". At present, only 14 states and the District of Columbia have refused the Commission's request for publicly available voter information. Despite media distortions and obstruction by a handful of state politicians, this bipartisan commission on election integrity will continue its work to gather the facts through public records requests to ensure the integrity of each American's vote because the public has a right to know. In fact, official push-back from the states has been strong and strongly worded. Mississippi's secretary of state invited the commission to "go jump in the Gulf of Mexico." Maryland's attorney general called the request "repugnant." Kentucky's secretary of state said "there's not enough bourbon in Kentucky" to make the request "seem sensible." On Twitter, voting rights expert and author Ari Berman likewise responded to Pence's misleading narrative with knock-out succession of factual blows about how states have actually responded to Pence and the head of the commission, Kansas secretary of state and well-known voter suppression proponent Kris Kobach. According to Berman's research, 20 states have refused to turn over any voter data: Arizona, California, Connecticut, Delaware, Kentucky, Louisiana, Maine, Maryland, Massachusetts, Minnesota, New Mexico, New York, Pennsylvania, South Dakota, Tennessee, Vermont, Virginia, Wisconsin, and Wyoming. Another 25 states — including both Pence's and Kobach's home states — have agreed to give only partial, publicly available information from their voter rolls: Alabama, Arizona, Arkansas, Colorado, Georgia, Idaho, Indiana, Iowa, Kansas, Mississippi, Missouri, Montana, North Carolina, North Dakota, Nevada, New Hampshire, Ohio, Oklahoma, Oregon, Rhode Island, South Carolina, Texas, Utah, Washington, and West Virginia. Two members of the commission — Indiana Secretary of State Connie Lawson and Maine Secretary of State Matthew Dunlap — are among those who refused to comply and another member resigned over the request. Even Kobach himself said Kansas would not comply with his own request. 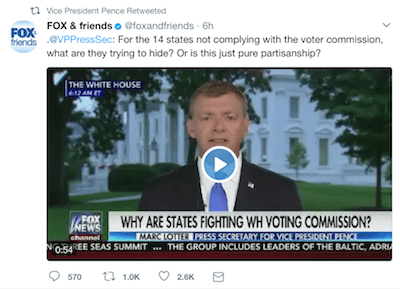 In stark contrast to its title and Pence's words, the actions the "Election Integrity Commission" belie its true purpose: to spread a fake narrative about "voter fraud" and to intimidate states into engaging in voter suppression on an unimaginable scale.